“A SLAP in the face of many thousands of Vermont residents who suffer from poor health and financial hardship in the private insurance market.” That’s what the Vermont Workers Center and its Health Care Is a Human Right (HCHR) campaign declared in a statement after Democratic Gov. Peter Shumlin abruptly withdrew his support for the long-awaited proposal for a first-in-the-nation single-payer health care program. Shumlin signed Act 48, which approved universal, publicly funded health care in Vermont, after the state legislature approved it in 2011. But now the governor says he’s worried about the cost for business–and he’s abandoning legislation needed to implement the system. 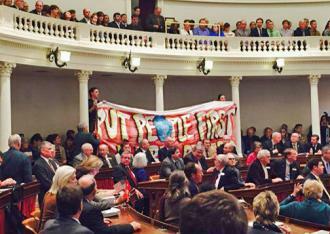 More than 200 activists disrupted the governor’s stuffy inauguration ceremony on January 8 with singing and banners calling on the legislature to move ahead with Shumlin’s financing proposal and hold public hearings. They noted that, despite several flawed assumptions, Shumlin’s plan would have provided top-tier health insurance and increased net incomes for 93 percent of those covered. Under the banner of “Now is the Time,” 29 activists were arrested at a sit-in after the inaugural address. That single-payer has even been part of the discussion in the legislature is due to the countless town meetings, rallies, lobbying and mass education efforts spearheaded by HCHR. Its multiyear campaign mobilized thousands of activists who brought the horror stories and hardships of the current health care system to people across the state. But Shumlin’s betrayal has thrown the movement on its heels, as it faces new obstacles for health care reform and tries to strategize about how to move forward. SHUMLIN MADE his announcement just in time for the holidays, sparking a Facebook meme: The Governor as the Grinch. Other roles multiplied in news headlines and among progressive bloggers–such as the captain who jumps ship, and the Scrooge unmoved by the plight of Tiny Tim. Shumlin himself played up the drama. Through three election campaigns, he presented himself as the “trailblazer” and “maverick”–in the words of USA Today–for signing Act 48 into law. Act 48 committed the state to a six-year path toward implementing a tax-funded, state-run health care program to cover all residents not otherwise covered by a federal plan. Stripped of any single-payer elements, Act 48 also committed the state to the immediate course of setting up an unwieldy and expensive private health insurance exchange, deepening and expanding the role of private insurance in the state. Despite its real limitations, Act 48 revived aspirations crushed by the Obama administration’s exclusion of single-payer voices and even a compromised “public option” from the 2010 Affordable Care Act (ACA). For more than five years, Shumlin vowed that he was the maverick who would get the job done. Last month, when he announced that the never-implemented program was “no longer affordable,” he presented himself as a different kind of cowboy: tight-lipped, stoic, willing to bear the “greatest disappointment of my political career” to spare the state from “massive pain” and “economic shock” that he and a handful of advisors had suddenly (so he claimed) learned would be Act 48’s outcome. — To edge out his 2010 Democratic contender and convince the state’s Progressive Party to withdraw their gubernatorial candidate, Shumlin did an about-face and pledged his support for single-payer. — He hedged that support, however, from the start. This program would be publicly funded but not by raising taxes on the wealthy. It would lower health care costs for businesses but keep hands off the state’s two private insurance giants–Blue Cross and MVP Health Care–that are major drivers in health care costs. — He brought industry leaders in as close advisers, such as Anya Rader Wallack, former interim president of the Blue Cross Foundation of Massachusetts. Shumlin was elected to office soon after Obama won the presidency, and he has followed the same script of hopeful rhetoric and disappointing results. With a reported net wealth of at least $10 million, Shumlin captured the votes of progressive liberals through his commitments to green energy, fighting global warming and, most importantly, single-payer. But once in office, Shumlin’s real priority–loyalty to business–became clear, outraging so many people who voted for him that he nearly lost last year’s bid for re-election to an unknown Republican. Shumlin has carried out deep cuts to social services, put state workers on furlough and rejected taxing the rich. His latest budget proposal calls for eliminating low-income fuel assistance, closing “underperforming schools” and allocating more state money to boosting tourism. — He championed allowing a squadron of deafeningly loud F-35 bombers to make their base at Burlington’s airport, with a devastating impact on the 10,000 workers and their children who live in the flight path. — He publicly denounced striking bus drivers and teachers during recent strikes–going so far as to call for outlawing teachers’ strikes. — He backed a natural gas pipeline carrying hydro-fracked gas through the western part of Vermont and under Lake Champlain. In other words, Shumlin is a true neoliberal politician. So when he leaked his financing plan for single-payer in the weeks before he officially dropped his support, it contained an appalling, but not surprising, premise: There would be a major cost shift from employers to workers. IN OTHER countries, working-class and labor parties have been essential to winning universal health care systems. In Vermont, the Progressive Party was a prominent advocate of universal health care, and has been widely seen as a successful state-level challenger to the capitalist parties. Immediately following the governor’s announcement, the Progressives issued a sharp criticism of Shumlin’s retreat. But welcome as that party statement was, it doesn’t align with the actions and statements of key Progressive players, who have continued to provide cover for the Democrats. The Progressive Party’s small size (eight members in the legislature) limits its role. It has a weak base in unions statewide. And the party has undermined its ability to act as an independent force through electoral collaboration with the Democrats. This included not running in key contested state races to ensure Democratic wins, and running most of their candidates on Democrat/Progressive fusion tickets. Perhaps most disappointingly, not a single Progressive legislator joined the HCHR’s call for moving forward with Act 48, holding hearings and implementing the publicly financed health insurance promised. The reality is that the left in Vermont, as elsewhere in the country, is very weak. If a working-class party is to play the pivotal role necessary to winning universal health care, there must be a wider assessment of current political weaknesses on the left, and concrete discussions of how to leverage the potential strength of both unionized and nonunionized workers to win real health care reform. What should be the strategic orientation of a third party? The Working Families Party (WFP) model of working as a pressure group inside the Democratic Party is clearly the wrong choice. The WFP endorsed New York Gov. Andrew Cuomo for re-election, even though he opposed many of the policies progressives supported. On the other hand, the campaign for the New York Green Party’s gubernatorial candidate Howie Hawkins led in a different direction, with an orientation on labor, taxing the rich, maintaining independence from either capitalist party, banning fracking and expanding public services (including health care). This strategic orientation would be helpful to debate in Vermont in the context of the movement for health care reform. THE PATH for Vermont to lead the way in health care has as much to do with the type of movement we build as the type of health care model that is eventually created. Vermont, after all, has no exceptional qualities to set it off from the rest of the country. The Democratic Party’s allegiance to business, the national push to offload the cost of health care onto the working class, the powerful and high-salaried CEOs who sit at the helm of Blue Cross Blue Shield-VT, MVP and the University of Vermont Medical Center–these are all political realities in this state, as in others. Given the vested interests in all sectors of the current for-profit system, neither capitalist party is interested in upsetting the highly profitable status quo, regardless of the consequences borne by the rest of us. Actively linking organized labor with the existing popular movement is a step that has largely been lacking in Vermont. Though many unions have signed on to the Health Care Is a Human Right campaign, participation in the movement by rank-and-file union members remains fairly thin. This weakness can’t be overcome overnight, but it will have to be if the movement is to have any real teeth going forward. One potential arena for building a stronger working-class base for the movement will be union contract fights looming in the coming months. The Affordable Care Act and Shumlin’s abandonment of reform have emboldened employers to go after the so-called “Cadillac plans” won by teachers, nurses, professors, state workers and others. Building real solidarity throughout the movement to preserve these fairly comprehensive, reasonably affordable coverage plans will be key to strengthening the movement as a whole. In addition, we need to build a strong core of social justice activists within our unions to win broader layers to participation in the movement for universal coverage. Such a rank-and-file union base, organized through a labor for single-payer network, could play a key role in forcing concessions from business and winning reform. It would give the movement a social weight and power that a strategy of lobbying and rallies lacks.